Hybrid laptop-tablet Windows 8 machines have been spilling onto the shelves at an exponential rate of late. 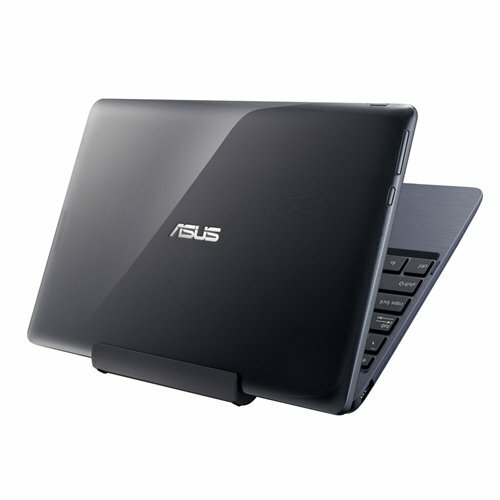 But none have been positioned like the affordable Asus Transformer Book T100. This 10.1-inch two-in-one device has budget buyers in its sights, and it’s probably that £349 price that’s landed you on this very page to see whether it’s genuinely any good or not. Is the T100 like the turbocharged netbook of the modern day; does its Intel Bay Trail architecture leave Chromebooks and budget laptops in the dust; and can we accept its plasticky build and small-scale compromises given its affordable price? The Transformer Book T100 isn’t a luxury device. We probably don’t even need to tell you that: the price has already hit that home. But it’s not cheap and nasty by any means either. Indeed, we’ve come to be rather impressed by the majority of the T100 throughout a full working week of use. The plasticky shell of the device doesn’t look bad thanks to a subtle texture under its glossy top. It’s a bit of a fingerprint magnet as is to be expected from such a material, but you’ll only prominently notice that in bright sunlight. Key to the design is the 10.1-inch, 1366 x 768 pixel resolution touchscreen that can be separated from the keyboard dock in order to function as a separate tablet. It’s easy enough to remove by the depression of a button to the centre of the dock, although putting it back in place does require lining everything up followed by a really firm press. Not rocket science, but not the more premium magnetic clip of some other devices, such as the Surface Pro 2 with keyboard dock. With a combined total weight of 1.07kgs, each half of the T100 weighs in at just over 500g. It’s not super light, but then it’s not restrictively heavy either. But what we found felt most right was the scale. Although it's not comparable by technical specification versus, say, the 13.3-inch tablet of the HP Split x2, the Asus's smaller scale is far more usable in the hand. It’s no problem to cart around and you can use it anywhere: on a lap, standing, sitting down. Stand on your head if you want. Perhaps best of all is that this Asus is all about full Windows 8.1. There’s no mucking around with the more basic Windows RT 8.1, and we find that an attractive prospect. The T100 also comes complete with Microsoft Office (Home & Student), so you’ll be able to get all those work-based tasks sorted out pronto too. But the Asus T100 isn’t quite perfection in all departments. As a laptop device the small keyboard feels a little bit squeezed up, but after a couple of days we found we’d adapted and had a decent typing rate again. The keys are resistive and have enough bounce in use, although the small spacebar was easily missed and almost didn’t feel sensitive enough compared to what we’re used to. But a bigger problem is the trackpad. And by big, we mean because it’s small. It also feels a little "tacky" in use; like our fingers would resist gliding across it from time to time. Still, it’s not the worst trackpad we’ve ever seen and its smooth surface and left-right divide for differentiated clicks is passable. Charging, however, is a loathsomely slow process and we don’t know why. The included mains adaptor and mini USB cable take an age to charge the device up. Five hours in and we’d gone from zero to 84 per cent of charge. Ouch. On the flip side, the latest Intel Bay Trail architecture means battery life takes the T100 to a new level of longevity. As much as charging up is irksome, the battery depletes even slower than the slow pace it takes to charge. We knocked out over 10-hours of use if we add it all up. Now that’s impressive stuff. The device does do some auto colour and brightness adjustment between software screens, however, which we found to be a bit annoying. The cooler cast of the desktop for example is a lot cleaner than the cigarette-stain yellow cast we found in Outlook via Internet Explorer. Power-wise the T100 offers up a quad core Z3740 1.33GHz processor under the hood, paired with 2GB of RAM. It keeps things ticking along nicely, from browsing, to Office, to movie playback; 1080p files - a bit over the top, given the higher resolution of the files compared to the device's screen - were no issue whatsoever and played silky smooth via VLC. But the T100 is not a heavyweight power house, so don't fool yourself into thinking that just because it's Windows 8 it's going to ace everything. More serious tasks such as dedicated gaming can be scrubbed off the list. It’s not going to run Battlefield 4, for example, as there’s no enough RAM or graphics support here. Pop into the Windows Store, however, and you’ll be able to play the games there without a hitch. The base price T100 comes with a 32GB eMMC drive to store all your goodies on, which, while not a huge amount of space, can be expanded thanks to the included microSD slot. A 64GB card is likely to set you back around £45 these days, which is a worthy investment. Other obvious storage options are cloud-based storage or there’s a USB 3.0 port for speedy delivery of data to an external drive if you have one. We’re really impressed with the Asus Transformer Book T100. Its 10.1-inch scale works well as either a tablet or a laptop, even if the keyboard does feel a little squeezed up on initial use. It’s something that we got over, though, and given how responsive and bright the touchscreen is you might find you only want to dabble in Windows with your fingers instead. The build is plasticky, but not offensive, and we’re also not huge fans of the trackpad, but otherwise the T100 gets a whole lot right: full Windows 8.1, a battery life that lasts out for ages, Microsoft Office on board and, as we’ve touched upon many times, a price point that opens up Windows 8.1 to a wider audience. Sounds like the beginning of the end of Windows RT devices to us. If you’re after a two-in-one for work and play then we think the Asus T100 ticks plenty of boxes without breaking the bank. It might not have huge power or storage capacity on board, and it’s not a luxury device with much wow factor - but that’s probably a given at this level of purchase. In context to the rest of the market it's a real winner. It might be a touch more cash than a Chromebook competitor, but the Asus has so much more to offer. We think it’s an excellent device and one not to be overlooked.